You have certainly succeeded in giving us a flavour of Lucia Berlin’s style – and it does sound rather like the sort of thing I like to read. I’ve heard good things about this collection, and I had no idea they were based on her own chaotic life. That’s what makes these stories so startling. They feel so real and ‘unpolished’ if that makes sense, almost as though we are being given little glimpses of her life. I know you’re generally not a huge fan of short stories, but this collection is definitely worthy of consideration. I think you’d like Berlin’s writing. Ah, right! My mistake – sorry. I’d got it into my head that you weren’t too keen on short stories. Well, if you ever fancy dipping in and out of a collection then it’s a good one to have to hand. Great review as always Jacqui. I’d heard of this collection but you’ve really succeeded in getting across what it’s like. Her life does sound rather eventful and I could see why she would draw on it for her stories. Definitely one I’ll watch out for! Thanks, Karen. I do find it difficult to review short stories, especially when a collection contains so many different pieces. I think these stories are very different from the types of literature you usually read, but if you fancy something different then they’re definitely worth considering. We’re in Raymond Carver territory here (at least to some extent), so it depends how you feel about him and other writers of his ilk. Joan Didion also came to mind as I was reading some of the stories, especially her novel Play It As It Lays. Great. I’ve yet to make a proper start on Didion’s non-fiction, although I have read ‘Some Dreamers of the Golden Dream’ which appears in one of her collections. Carver are enough to convince me I should read it soon. Oh, great – I can’t wait to hear what you think of it! I’m not the first person to make the comparison with Carver, but there are touches of Joan Didion here too. I’m pretty sure you’ll love these stories. There was so much hype surrounding this collection when it came out that I was prepared for disappointment but it’s wonderful. Berlin’s short, crisp sentences coupled with an acute observation result in some very striking stories as you’ve illustrated beautifully in your review, Jacqui. Thanks, Susan. Yes, I recall seeing some positive mentions of it on Twitter at the back end of last year (possibly around the time of the holidays as a couple of people I follow must have been reading it over Xmas). I usually stay away from the buzz books, but something about this collection appealed to me. Her observations are wonderful, aren’t they? The sorts of moments that could only have come from personal experience. Did you review it, Susan? I’ll head over to yours in a while to take a look. I really like short stories so glad to read this review. 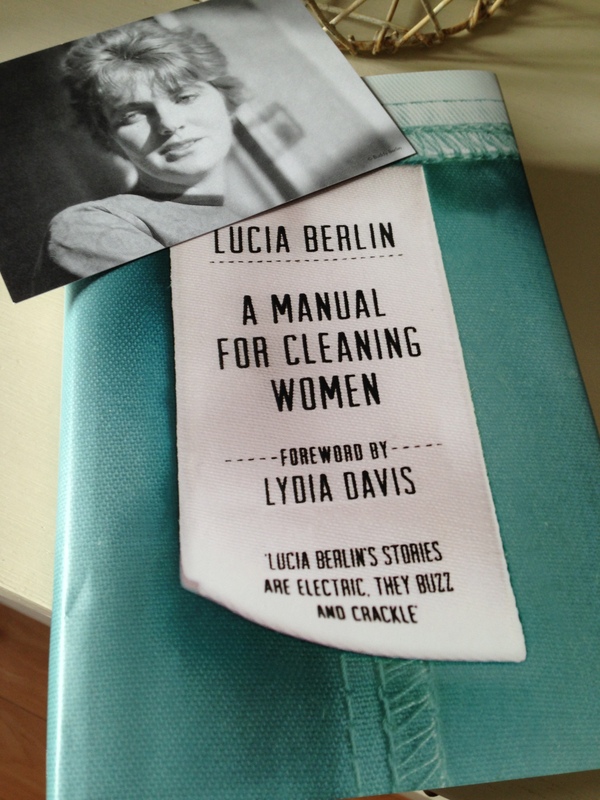 I admit to not having heard of Lucia Berlin. I only really discovered her last year when I read a review of this collection in The Guardian. All credit to Picador for reissuing these remarkable stories. I was so startled by the story about her grandfather the dentist. It gave me that shiver down the spine you get when you’re in the presence of something remarkable. I probably thought the collection was a bit more uneven than you did, and my overall impression is more weighted towards her humour, but like you, I particularly liked the feeling that the story is flowing naturally and not being forced and managed. You’re very welcome – it’s interesting to compare perspectives with you now! I loved the humour in some of these pieces, particularly the early ones. My lasting impression may well be a little skewed towards this picture of a woman on the edge. I found some of the stories very haunting indeed. Mijito keeps coming back to me (as does the one involving the alcoholic mother), so I suspect some of them will stay with me for quite some time! This is great to read! I’ve been wanting to get to this much-talked about book for a while and, while it’s been in the periphery of my vision, I’ve never looking into her bio or what her stories are about. So interesting reading about her background and how that translates into her fiction. It’s wonderful to hear you think so highly of her writing because I’ve read criticism about her stories as well. They do sound like the kind of fiction I’d love though! Thanks for the review! Glad to be of service, Eric! There’s plenty of information about Berlin’s life at the beginning of the book as it comes with a foreword by Lydia Davis and an intro by Stephen Emerson who compiled the stories for this book. Plus there’s a brief bio at the end of the collection. It all feels very relevant to her work, so it’s useful context to set the scene for what comes through in her stories. I’d love to hear what you think of this one. Can you recall what the criticisms were? It’s always interesting to hear an opposing view or another perspective on something like this. I had never heard of Lucia Berlin. She sound as if she had an eventful life. As you allude to her experiences seem like they influenced her writings. The grimness that you mention is not surprising. I would like to give this a read. There’s quite a lot about Berlin’s life in the foreword and intro, plus a brief bio at the end. Apparently one of her sons said, after her death, “Ma wrote true stories, not necessarily autobiographical, but close enough for horseshoes.” There’s a sense of family stories being used as a foundation for her work with pieces being sliced, shaped and added to here and there. Some of them came from her imagination but even so there is something truthful about the situations and emotions she describes. They feel very authentic if that makes sense. Curiously, I first heard of Lucia Berlin just yesterday, when I received an email announcement of a sale of bunch of rare books (I don’t know how I get on these lists), among which were several by Berlin. The comparison to Didion intrigues me – that to Carver maybe not so much. And that title – is it “Cleaning Women” or “Cleaning Women” or both, or is that just a stupid question? How timely – that’s serendipity in action for you! I’d say she’s probably closer to Carver than to Didion, although a couple of the stories in particular reminded me very strongly of Play it As It Lays. She’s definitely worth a look. As for the title, no it’s not a stupid question at all. In fact someone else raised a similar point on Twitter when I shared a link earlier today. (I hadn’t even thought about the different ways of interpreting the title until it was mentioned this morning!) As far as the titular story goes it’s the latter, but there’s a touch of the first version across the collection as a whole, especially once you discover that a few of the pieces are set in a detox clinic. I’ve been dipping into this wonderful collection since receiving a copy last year; whilst I could have easily devoured it I’ve manage restraint and leaving time between each fix is certainly helping me digest the stories and appreciate the superb writing… you certainly captured this quality and the essence of her stories well Jacqui. Great review! Thank you! That’s fantastic. I’m so glad to hear that you’ve been relishing these stories too as they struck me as being right up your alley. It’s all too easy to overdose on short stories, gobbling them up one after another as you read through a collection. I tried to read just one or two a day over the course of a few weeks, and even that felt quite heavy at times. It takes a while for them to sink in. Such a striking collection of pieces. This is a collection that I’ve had my eye on for a while now. I’ve heard lots of good things. It sounds like her own life would make a good novel – I am always in awe of people who live life so hard.. Yes, me too. She had a tough time of it, especially in the early years. In some ways, you could probably view this as a loosely fictionalised version of Berlin’s life. Even though it’s a collection short stories, when the pieces are viewed together they paint quite a picture. I’ve seen this collection around as well, but have actually paid little attention to it. But I’m certainly paying attention now; I love the quotes you picked. I’m really glad you like the quotes. The writing is excellent, very natural and unpolished (in a good way). Her life was tough and full of incident, so she had plenty of material to turn to for her stories. It’s good to hear that you’ve seen it around and about as her work deserves a wide audience. I hope many more readers discover her stories. That final quote is spectacular. I’m not in the market for new short fiction right now – too much already unread, but very impressive there. Great review. I’ve heard so many good things about this, I’ve wanted it since it came out . Sadly it’s fallen victim to simply not having enough time to read all I’d like to, but I’m sure I will get to it some day. Thanks, Grant. I think it’s worth making the time for this one. Berlin’s life was tough, unconventional and full of incident. I would be fascinated to hear your thoughts on her stories! I read the first story of this collection and was not impressed. That first story seemed a little too rough, simple, and primitive. I gave up on the book, but the praise from reviewers like you continues. I’m wondering if perhaps the stories are published in chronological order, and that first story was an early effort. I’m about this close to giving the collection another try. Give it another try, Anokatony! I think it’s worth reading at least six or seven of these stories just to get a better feel for her work. (I’d suggest you include the title story, Tiger Bites, and Mojito in that group – if you’re not feeling it after reading these pieces then she’s probably not the writer for you.) There aren’t any notes on the publication dates of the individual stories, so it’s hard to say if they’ve been collected together in chronological order. It’s possible, but I don’t know for sure. They are quite raw and unpolished, though. I must admit to liking that aspect as they felt very natural and authentic to me, so maybe it’s just a question of personal tastes! It worked. Knowing that the stories I pretty much arranged chronologically, I will start with a middle story to get a more representative story to read first. Great. Let me know how you get on – I’ll be interested to hear. You’re welcome. Even though it’s not entirely autobiographical, she certainly drew very heavily on her own experiences. Yes, quite an eye-opener in many respects. I think you’d like the lead story, Guy – the wry humour really comes through. I’m usually not a fan of short stories (I always want more in the end), but your review was fascinating. Now I feel I have to read it! It’s been a while since I read a really memorable collection of short stories but I really like the sound of Berlin’s work. It’s good to hear that her stories don’t feel artificial in any way too – I’ll definitely check these out. Great. I’ll be interested to see what you think of them. The absence of any deliberate ‘framework’ was one of the things I liked most about these stories. They feel so natural, almost as though you are reading excepts from Berlin’s notebook or journal. Hi, Jacqui! How are you? What a wonderful review on an intriguing short story collection. I’ve been so curious about this book because of the title. I even thought… “what kind of story having such title?” But, having read your review, I think it’s a truly worth-a-try book. Oh, can I assume that it’s the best point to start if we want to get to know Lucia Berlin? All the stories you told here seem personal. You’ve done a splendid job here. A great evocation of the range and merits of the writing. The mere fact of your work is a considerable tribute. If not too presumptuous — thank you. Re: Anokatony’s question: “Angel’s Laundromat” is the title story from Lucia’s first collection; the piece first appeared in the Atlantic Monthly in 1976 (a rare mainstream publication for her). She later placed it at the start of the first “new and selected stories” volume from Black Sparrow. The very earliest story in A MANUAL is “El Tim,” from the early 1960s but the collection is still loosely by order of composition, with some exceptions she made herself in ordering the Black Sparrow books, and some that I made. Stephen, thank you so much for taking the time to comment on my review – I really do appreciate it. Berlin’s stories felt so fresh and striking to me that I really wanted to do them justice in my piece (or at least to try to as far as possible). Thanks also for your response to Anokatony’s question about the order of the stories – that makes perfect sense. I’ll let him know that you’ve provided this information about the sequencing. Thanks once again for taking the time to drop by. Great review. I’ve never heard of her but the comparison to Didion and the quotes you picked appeal to me.